Modern snowflakes - Winter Nail Art Challenge | Light Your Nails! Today I am joining Helena of Lacky Corner for the Winter nail art challenge. The theme is snow, all kind of snow. Because I already did a snow-themed mani last week I wanted to do something quite different from that one. My idea was modern snowflakes instead of classic ones. I grabbed my newly arrived MR-03 stamping plate, a white stamping polish and a red base. And that’s it! Oggi mi unisco a Helena del blog Lacky Corner per la Winter nail art challenge. Il tema è la neve, di qualsiasi tipo. Siccome ho già fatto una manicure a tema neve la scorsa settimana ho voluto cambiare radicalmente stile. L’idea è stata di fare fiocchi più moderni invece di quelli classici. Ho preso la mia nuova plate da stampa MR-03, uno smalto bianco per stampa e una base rossa. Et voilà! My issues with white stamping polishes are still there. When I use white I always get blurry lines. Gotta hate that. Other than that I like that these snowflakes are very different from last week’s ones. Mission accomplished! How do you like my mani? Do you prefer these modern snowflakes or the classic ones from last week >here<? Let me know! I miei problemi con gli smalti bianchi da stampa continuano come vedete. Mi vengono sempre bordi molto mossi e poco precisi. Odio questa cosa. A parte questo sono contenta che questi fiocchi di neve siano effettivamente molto diversi da quelli della scorsa settimana! Vi piace questa manicure? Preferiti questi fiocchi di neve moderni o quelli più classici della settimana scorsa (<qui>)? Fatemi sapere! Thanks for your comment! Sorry I don't publish links. Love this modern interpretation of the theme. Great one! Sai che l'idea del fiocco moderno mi piace? Anche io ho problemi con lo stamping bianco, chissà se troverò lo smalto adatto prima o poi! Se lo trovi prima di me fammi un fischio!! Mi piacciono questi fiocchi di neve stilizzati, diversi dal solito. Purtroppo il bianco crea problemi anche a me, devo sempre prestare molta attenzione con questo colore. That's a great stamping image! This is so amazing, I love the modern twist! I always thought I was a classic pureist, but I really like these too. 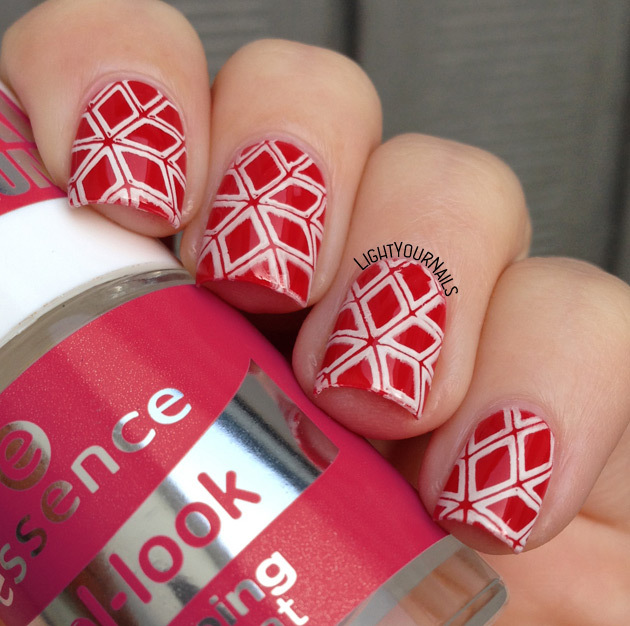 That red base is so lovely with the stamping! Gosh, it's hard to pick between the two manicures, I really like them both! Perhaps I love these a tiny bit more, they're so cool! I like this manicure, it's unique and very modern ... it sure is different from the traditional snow flakes. I have the same problem with white stamping polish, I don't know if its just me doing something wrong or is it the polish or the template? I finally have decided that its the white stamping polish. By the way what is the template that you used? I know that you said "MR-03 stamping plate" but that does not describe the brand of the template... could you let me know? Thank you. It's just called MR-03, no brand mentioned. I purchased it on Aliexpress searching for Christmas stamping plates! Beautiful take on a snowflake. To avoid the blurry lines with your white you can try waiting a second between getting the image on your stamper and placing it on your nail. IT almost looks like the polish is a little wet and squished a little when you applied the image. It's still a great job though. I will try that! Thanks for the tip! Love it! Very graphic and modern indeed! Thank you! You're never late, thank you so much for taking the time to visit my blog, whenever you wish!